We measure the other-regarding behavior in samples from three related populations in the upper Midwest of the United States: college students, non-student adults from the community surrounding the college, and adult trainee truckers in a residential training program. The use of typical experimental economics recruitment procedures made the first two groups substantially self-selected. Because the context reduced the opportunity cost of participating dramatically, 91 % of the adult trainees solicited participated, leaving little scope for self-selection in this sample. We find no differences in the elicited other-regarding preferences between the self-selected adults and the adult trainees, suggesting that selection is unlikely to bias inferences about the prevalence of other-regarding preferences among non-student adult subjects. Our data also reject the more specific hypothesis that approval-seeking subjects are the ones most likely to select into experiments. 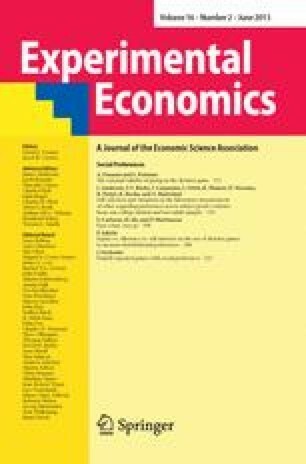 Finally, we observe a large difference between self-selected college students and self-selected adults: the students appear considerably less pro-social. The online version of this article (doi: 10.1007/s10683-012-9327-7) contains supplementary material, which is available to authorized users. We thank the editor and two anonymous referees for useful comments. We received helpful comments from Simon Gächter, John Galbraith, Herbert Gintis, Nikos Nikiforakis and participants at the 2011 International Meeting of the Economic Science Association in Chicago (IL). The Truckers and Turnover Project acknowledges financial and in-kind support from the cooperating firm, and financial support from the MacArthur Foundation’s Research Network on the Nature and Origin of Norms and Preferences, the Sloan Foundation’s Industry Studies Program, the Trucking Industry Program at Georgia Institute of Technology, the University of Nottingham, and the University of Minnesota, Morris. Götte acknowledges support from the Federal Reserve Bank of Boston, and Nosenzo from the Leverhulme Trust (ECF/2010/0636). The views expressed are those of the authors, and do not necessarily reflect those of the supporting entities. Gächter, S., Nosenzo, D., Renner, E., & Sefton, M. (2012, forthcoming). Who makes a good leader? Cooperativeness, optimism and leading-by-example. Economic Inquiry. doi: 10.1111/j.1465-7295.2010.00295.x.